At 6.5 mm, Huawei’s Ascend P7 is one of this year’s thinnest smartphones - at least if we’re talking about devices that are widely available around the world. The P7 is also one of the best Huawei handsets we’ve tested lately, so we’re genuinely interested in its successor - which, as we told you in November, should be (unsurprisingly) called Ascend P8. 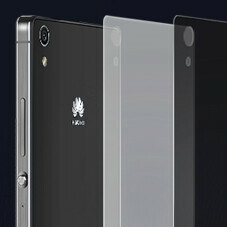 November was also when we heard that the P8 would have a thin metal body, just like the P7. Now, a couple of photos that allegedly show the chassis of the P8 seem to confirm that metal is indeed one of the main materials used to manufacture the new smartphone. According to Chinese website CNMO, the Ascend P8 should be released in March 2015. It’s said that the new handset will be a bit larger than the P7, sporting a 5.2-inch 1080p display, instead of a 5-inch one. Other rumored features include an octa-core Kirin 930 processor, 3 GB of RAM, 32 GB of internal memory, and a fingerprint sensor. The Ascend P8 could cost slightly less than $500, thus being a bit more affordable than most flagship smartphones are nowadays. Interested? Next year will be interesting as far as smartphones r concerned. Device looks likes 6 inch. Yeah I also think its a A tablet like Mediapad X1 . The size says it's not a 5.2 inch device . Mediapad X1 was launched in MWC 14 and according rumours it is also launching at the same time period . So, it has a big chance to be a successor of Mediapad X1 . Correct, plus the P7 power button is located at the center and is a rounded Sony style button. This chasis on the other hand has the power way on top above the volume button and not the rounded style. The camera led location also matches X1 rather than P7. phone is phone all phone look the same who build better i will use it or you want triangle phone or some thing ? and china is country not phone brand. If you've worked for a Chinese manufacturer you'd know Joey statement has some truth in it. And before you ask, yes I work for one lol..
expensive and bend i dont buy who idiot and use it i dont care. Do they take reasonable photos (ie close to galaxy) they're a bit cheaper here in south Africa. I seem to think the p6 or p7 took terrible photos so I didn't get it the end. Pity it was cheaper and the form factor is beautiful. Those sides look really thick, don't think that thing will be bending. Huawei ascend p8 max ? maybe.